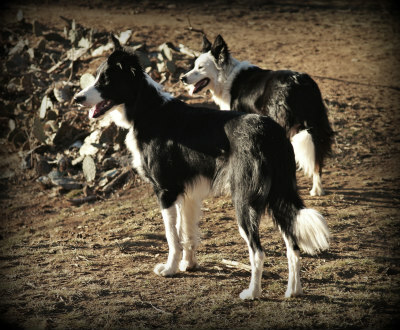 The Border Collies run ahead of me as I hike to the pasture below the barn. Mesa knows the drill - let the Dorper and Jacob flock out of the lower pasture, take them through the barnyard and into their pen for the night. Wyatt, the pup, has done this enough times to know how things should flow. He is getting some maturity now and is finally beginning to pay attention to the sheep and not just bounce along with Mesa. Lily, the older dog, walks beside me. 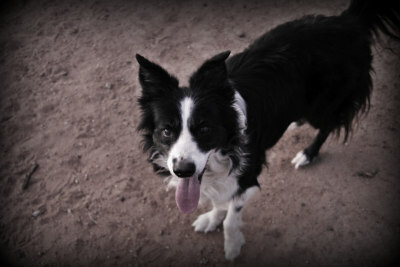 She has long since given the reins to Mesa and concerns herself more with the perks of being a ranch dog rather than the actual work of it. Lily is happy enough to ride in the truck or the ATV and watch Mesa work. Wyatt and Mesa arrive at the gate and wait. I'm the one with the thumbs. Thumbs are needed to work the chain on the gate. One day I will devise another system so the Border Collies can do this themselves. No thumbs needed. Then I can sit in the porch swing and watch the dogs do my chores. Until then, I have to hike down there and back. Lily and I arrive to open the gate and the sheep file out. Once out they begin the uphill run. Lily waits with me while I close the gate. Mesa and Wyatt go with the sheep. When I start back up the hill I see Wyatt waiting for me by the barn. Something hasn't gone according to plan. I've forgotten to open the gate so the sheep can file into their pen. Mesa is holding them by the gate while Wyatt has come back to inform me that I had one job - open and close the gates - and I have failed miserably at that. He escorts me to where Mesa is holding sheep. The Labrador Retriever, who until this moment has busied himself with the arduous task of selecting just the right stick in a yard full of fallen limbs, has made his final selection and now gallops into the flock of sheep with a log in his mouth. They scatter and run like hell. On their way down the driveway the sheep notice an open gate which leads to another pasture. 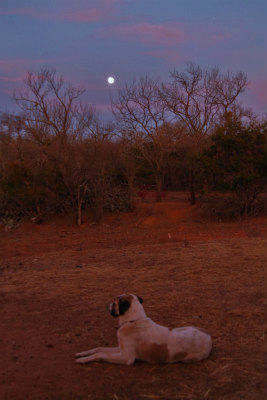 Like a flock of birds they all hook a left and head through that gate and into 150 wooded acres and a rising moon. I am helpless to stop them. How long will it take to get them all back? They thunder down the fence line as the Blue Moon rises above the trees and I hurl a curse into the sand at my feet. How far will they go before I can even reach the gate? Not far. A black and white streak glides ahead of the galloping sheep and turns the flock back on itself. I haven't even started toward the opened gate and the sheep are now loping back into the barnyard. My heart smiles as my eyes search to identify my savior. I am confident it's Mesa. I'm wrong. Mesa and Wyatt stand in the barnyard and watch Lily neatly pen the runaway flock. She steals a glance at me as she slides past. 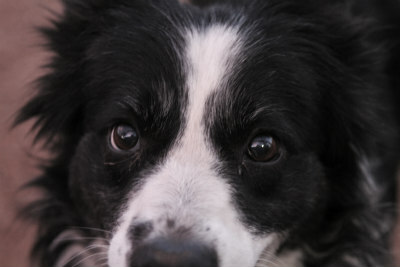 The little black and white dog saved me a lot of work and she knows it. This flock is small, but it's particularly silly, so she waits at the gate as the sheep file in. Mesa and Wyatt close the loop around them at the back. I shut the gate and Lily gives me a smug look. Apparently she is not retired. She is in charge. There is a difference. Lily has made it clear that just because she chooses to let Mesa do all the work it doesn't mean that she can't do it anymore, merely that she's content to let others do the chores as long as they don't muck it up. And when they do, she is still here to swoop in and clean up our mess. Lily is awesome. The Perfect Dog, remember! Awesome girl!! I wish my boys had an ounce of what she's got. A trip to Mickey D's for Lily. I shall make sure to pass on to Lily that you guys cheer her efforts. Lily deserves HUGS and a juicy meat chop for that! YAY LILY!